Ceri: Every week complete beginners, self-taught amateurs and experienced designers from all over the world—responding to sometimes the most bizarre, random and seasonal themes—get to compete against each other, on an equal footing, for the public’s vote. 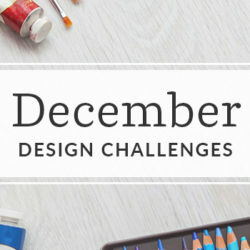 Welcome to the addictive world of the Spoonflower weekly Design Challenge! The first time I entered the weekly challenge was the first time I’d ever made a pattern. 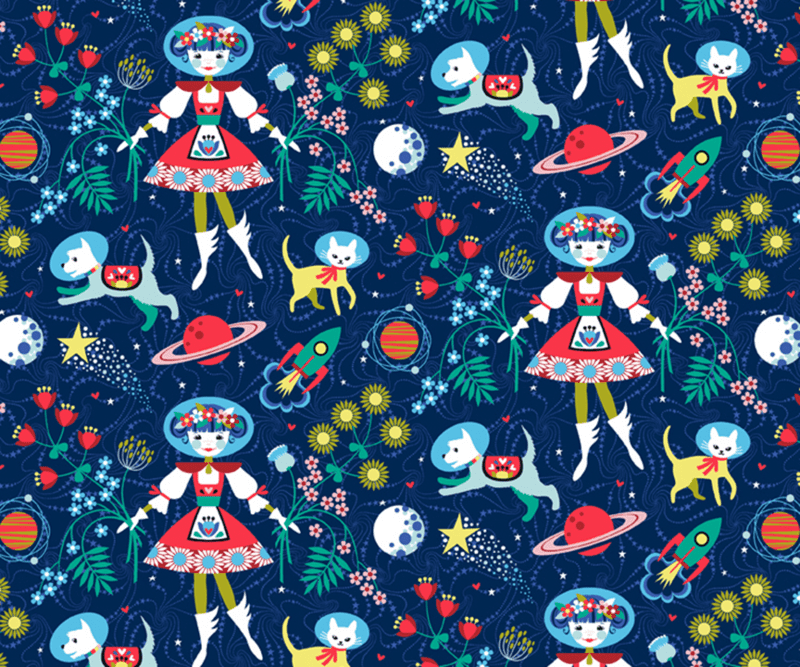 It was a couple of years ago and I remember that I was thrilled I’d been able to create something that could pass muster as an actual repeating pattern! I’m a graphic designer, but as a typographer I spend my days arranging text on a page, not drawing pictures or illustrating books. I am competent with image editing software and I have loved fabric and sewing all of my life, so the desire to create something original which could be printed onto material and used in one of my craft projects was very strong. But where to start? How could I learn to ‘do’ it? Someone I knew suggested trying the Spoonflower challenges to help me along, and I agreed that this seemed like a good idea. 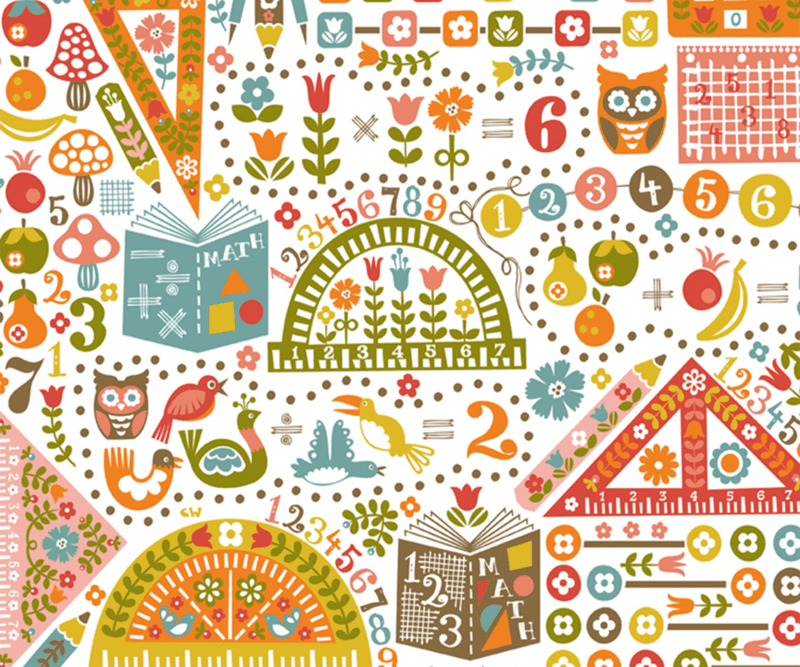 I’m used to working from a brief so I decided I’d use the weekly challenge as a personal deadline to learn how to create a repeating pattern … and then I’d enter the contest for fun at the end of it. 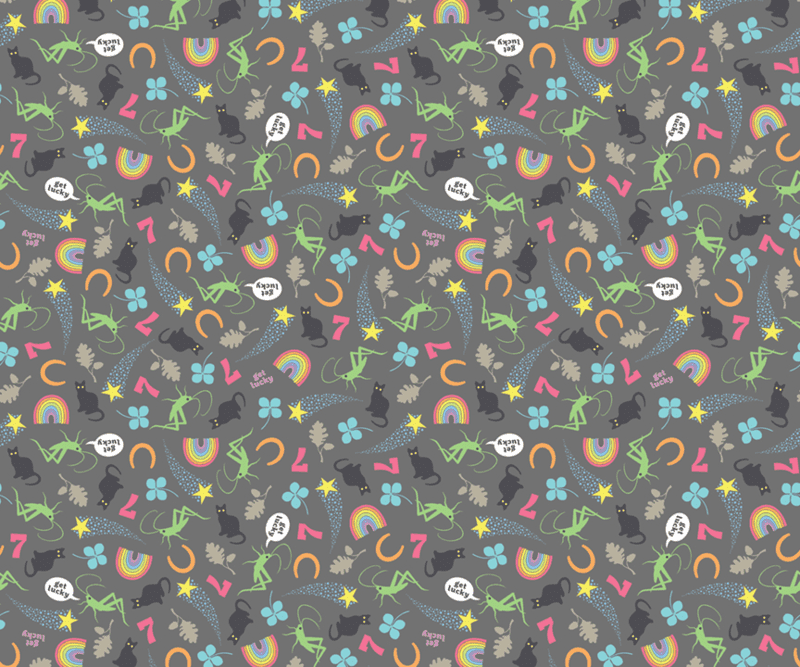 I browsed the upcoming themes and settled on “Ditsy Crickets.” From memory, the brief described crickets as lucky charms, so I decided to keep it simple and create a design featuring tiny tossed crickets surrounded by lots of other good luck symbols. I read some ‘how-to-create-a-pattern’ books and studied some online tutorials (there are many excellent examples out there, including the very recent Spoonflower collaboration with Creativebug) and found that I loved getting into the nitty-gritty and mathematics of putting together a repeat pattern. I can’t overemphasize the sense of achievement I felt when I got that lightbulb moment and finally figured it all out. At that time, the Daft Punk song ‘Get Lucky’ was being played on the radio non-stop, and it became my theme tune, and subsequently the title of my design. I’m a little embarrassed to look at my first effort these days, but it wasn’t such a bad attempt — I achieved my objective of learning how to create a pattern, and I even ended up in the top 50 at the end of the contest. I was hooked! Since then, I’ve continued to develop my skills by participating in lots of the weekly design challenges—with varying degrees of success. I’ve notched up a few top tens, a win in a cut-and-sew halloween costume contest and probably my proudest moment—getting to the finals of the Fabric8 contest last year. I asked fellow Spoonflorist Christine Witte, one of the most prolific weekly challenge winners, what she thought might be the secret of her success, and if she had any advice to share with us. 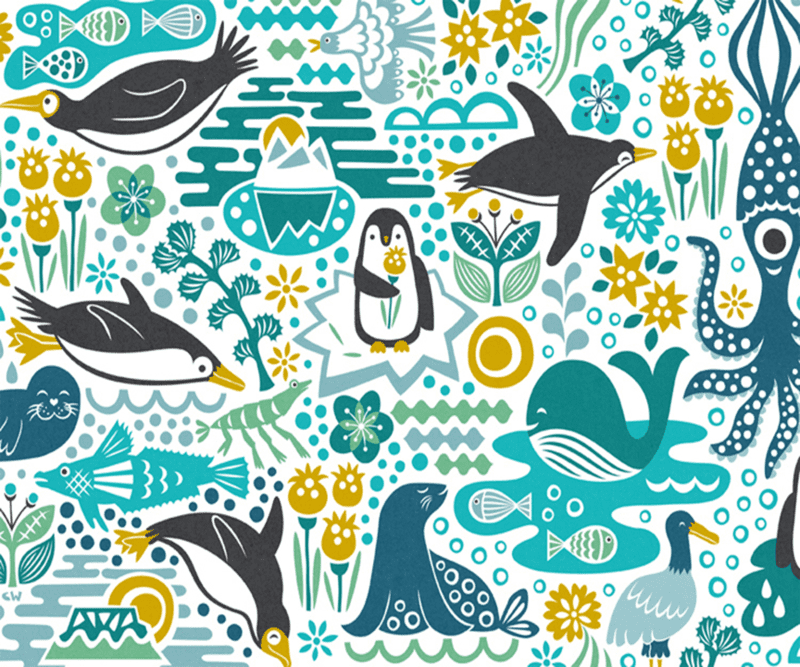 Christine features consistently in the top ten (often in the number one slot) with her beautifully whimsical designs. 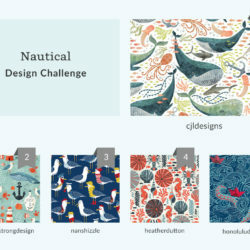 Christine Witte: I don’t think there is a secret to winning a Spoonflower contest, or at least I don’t know it or I’d be winning all the time. But I do think designs that a viewer can quickly grasp visually tend to do well. This is especially important among a pool of hundreds of entries where voters may not spend much time viewing each design. The colour palette can play a big role in the notion of ‘instant appeal’. Is there enough contrast or does everything blend together—or is the contrast too hard? Do the colours create a mood that suits the subject matter or title? Mood is perhaps the most important part, as it can create a relationship with the viewer—is it able to evoke a positive emotional reaction? Of course there are other aspects, such as the quality of icons or shapes, textures, and little details that can play a role. CW: The question is: How am I going to appeal to the greatest number of voters? But going down this route can reduce the fun in designing, which would likely reduce the success of a design as well. Enjoy your own creative process, keep experimenting, and observe what works well for you. Last but not least, having low expectations has always served me well. You might win when you least expect it! In my own experience, I’ve noticed that I’ve had the most contest success when I’ve managed to put my own individual twist on the theme and not plumped for an obvious solution. I try to make my entries stand out from the crowd by giving my designs an unusual approach — this might be in the way I tackle the drawing style, or the way I interpret the theme, or in an unexpected colour palette. Like Christine, I would urge you to think carefully about your colour palette. I spend a lot of time considering colour because I find this part of the design process the most tricky—and it’s so important to get it right. Of course, there’s never just one correct solution, but the wrong one can kill a design. Consider a palette that will not only compliment your design, but will also stand out from the crowd. You don’t want your brilliant design to be skipped over because no one noticed its too-subtle or drab colours. If you’re stuck for inspiration, look through magazines, or even your wardrobe. You’d be amazed at the great colour inspiration I’ve had from my knitwear in the past! There are even websites specifically set up to create colour palettes for you, such as Kuler or Colourlovers. The internet has also made finding reference material very easy. What does a bee actually look like close up? I’m really not too sure, but give me 5 seconds with Google and I can find 1000 macro photographs which will show me exactly what they look like. But don’t copy other people’s ideas or artwork. That is a big no-no. Sometimes it can be easy to fall into the trap—often unwittingly—so you need to be extra vigilant. When you upload a new design to your Spoonflower account, a helpful prompt will remind you of this: ‘Please do not upload a design that you did not create unless you have permission to do so. 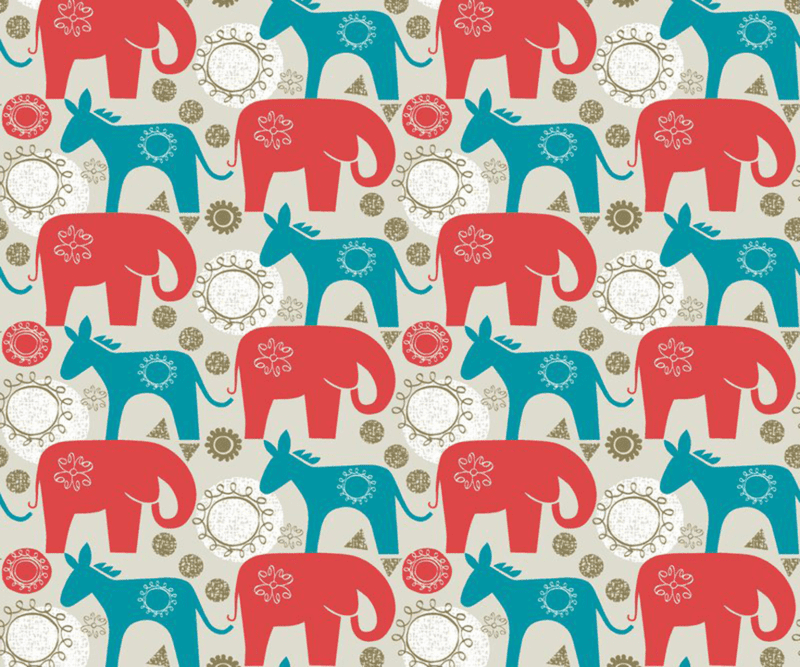 Reproducing copyrighted, trademarked or otherwise protected material is a violation of Spoonflower’s Terms of Service.’ It’s also easy to take clipart from the internet and incorporate it into your pattern, but these entries rarely do well in a contest. Please take these important issues very seriously and only create artwork which originates from you. I have discovered two unexpected bonuses as a result of entering the weekly challenge contests. 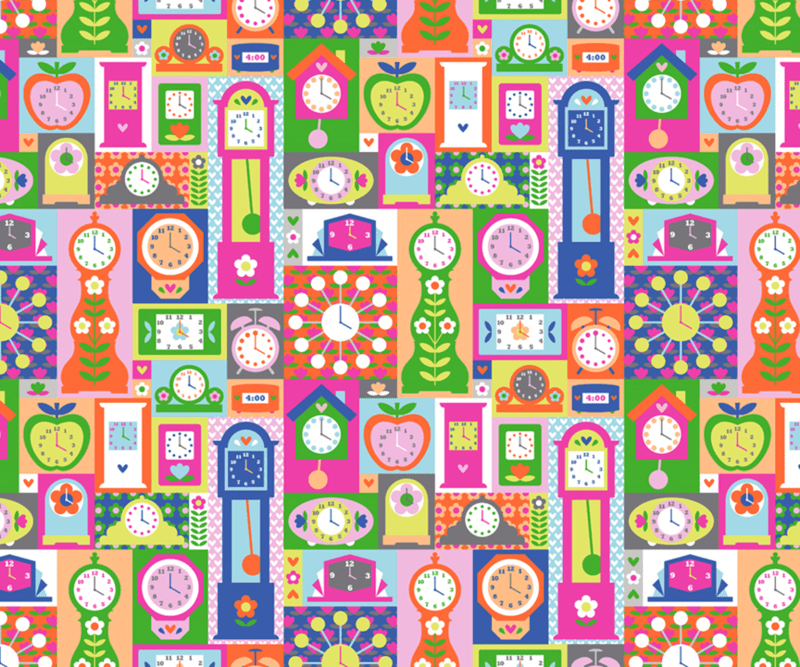 Firstly, it introduced me to the very supportive Spoonflower community of fellow designers and customers. It is wonderful to be on the receiving end of great advice, encouragement, praise and commiseration when the contest results are published each Thursday. 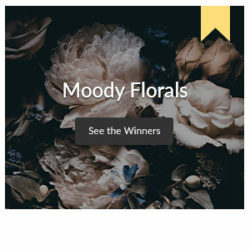 I also noticed that entering the contests raises your profile and gets you noticed, regardless of where you place—this increases visits and ultimately sales in your Spoonflower shop. A good tip to get noticed and improve your contest ranking is not to bow out from the challenges whose themes seem too difficult or too obscure at first glance. These are the contests which will garner fewer entries and could be your chance to shine. Try to view them as an extra challenge—for example, tell yourself ‘I CAN and WILL make a beautiful pattern featuring three-legged donkeys/bathroom mould/ lettuce leaves (with a limited palette of orange and brown) … or whatever other mischief the design challenge team have come up with for us that week! 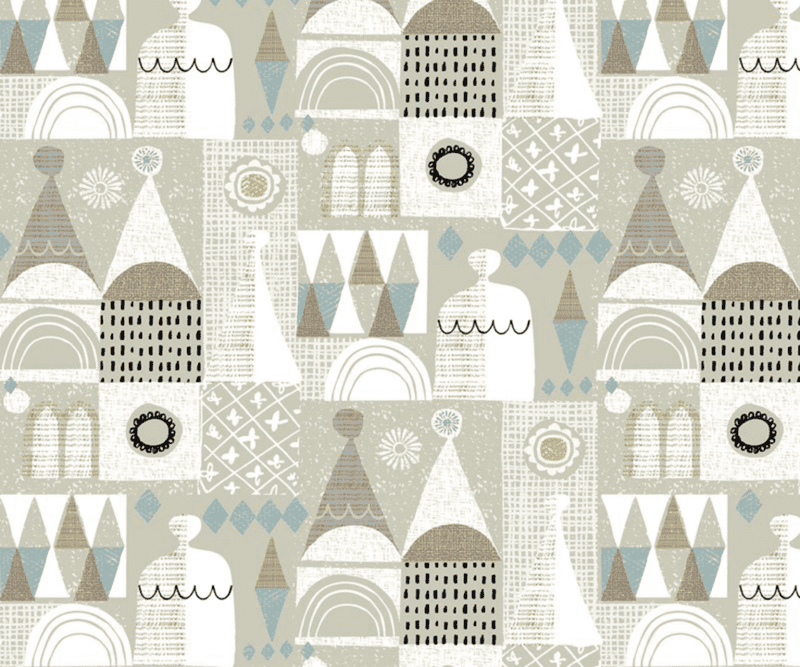 But seriously, the Spoonflower contests are a fantastic learning tool. They will push your abilities and imagination. Try to enter as many of the weekly challenges as possible in your first year and then look back at what you’ve achieved and see how far you’ve come—you will be amazed. 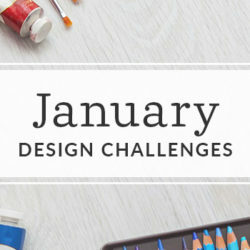 So whether you are a closet pattern designer, someone who just needs a push to get started, or an experienced designer in search of a fresh approach, I urge you to give the weekly design challenge a go. Who knows where it will lead you? Maybe the thrill of a top ten? Or even the much-coveted first place? You’ll never know unless you try. Excellent article and some great advice and fantastic designs! I have entered one contest but I think I’ll try again! Thank you Jenn, and good luck in the next contest. Very helpful article! Thanks for sharing your knowledge!! Such an encouraging article. It’s a great reminder to hear that everyone had a shaky hand when hitting the “Submit” button that first time! I completely agree about entering the more strange contests. I think it really hones your problem solving skills and creativity. coming from the other side of the lens, i love voting on the contests and seeing what all the amazing designers have been inspired to create! got my fingers crossed for the fabric8 finalists! I always assumed black kittys as good luck, glad someone else is open enough to put that small essence in a theme , it is enough to literally lead as the main selling point for particular peopke. It hits home. Wise ???? Thank you Helen, glad you found it helpful! Great entry Pinky! Good luck. Totally agree Tiffany. I get much more satisfaction from tackling the more difficult contest themes — and tend to do better! At the risk of sounding super techno dumb, what is the best way to get a design from hand drawn paper to computer rendered? (What software) I have always been interested but never tried….